The Dividist Papers: Quantifying "A decisive quantum of voters in the middle.."
Quantifying "A decisive quantum of voters in the middle.."
This happens periodically. 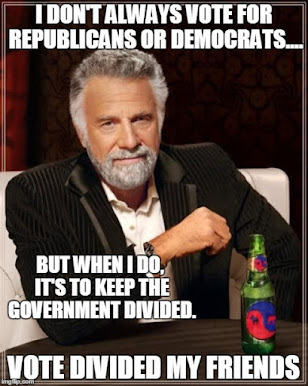 The Dividist has been beating the divided government horse on this blog for a dozen years. We think we know all the arguments for and against. Then someone comes along and with a pithy turn of phrase crystallizes in a few words what the Dividist has spilled gallons of ink (megabits of pixels?) trying to explain. "I would posit another framework to understand politics over the past 40 years, one in which the two parties are basically evenly matched, strong ideologues dominate the bases of both sides, and a decisive quantum of voters in the middle is up for grabs. This process has yielded a general pattern that seems to repeat: One party surges to control the government, but this is short-lived; the opposition quickly gains a foothold; and divided government persists until the opposition finally takes total control, repeating the cycle." "Think of it this way. An election is a scale. 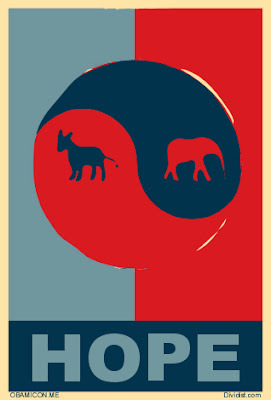 Pile the large mass of partisan Democrats on one side and the large mass of partisan Republicans on the other, roughly balancing the collective polarized "Partisan Dead Weight" (PDW) that can be relied on to always gets on one side or the other. Then there are some smaller, more mobile weights, that call themselves Independents... an "invisible hand" that votes for divided government ... [INSERT MANY HUNDREDS OF WORDS] ... What if this "invisible hand' that prefers divided government becomes visible? What if the "collective unconscious" that prefers divided government, starts making that decision consciously? It could change elections in the same way 3rd parties do, by siphoning partisan support but without the spoiler effect. The beauty of this idea is that this party needs no candidates, no leaders, no platform, no conventions, really none of the trappings of a political party. Dividists are voting by objective, not by platform and not out of party loyalty." "On this blog we advocate a specific voting heuristic that can be implemented by a relatively small percentage of the electorate, perhaps as little as 5%. The target readership are voters who are willing to cast their ballot based on a rational evidence-based voting strategy that will result in better federal government. The strategy requires that the voter be capable of casting their vote without consideration of party loyalty or political ideology. The voter must even be willing and able to vote for candidates they dislike, based on accomplishing a greater goal of more fiscal responsibility, stronger oversight, less spending, more deliberately considered, carefully crafted legislation and better overall governance. 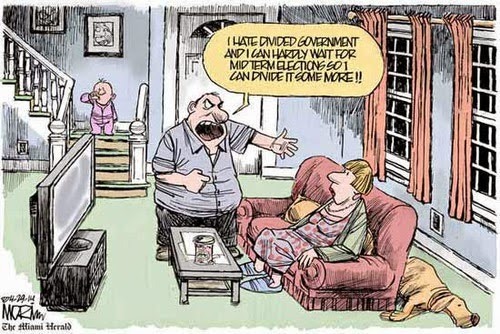 In short, the voters must be willing to vote for divided government. This blog is for those potential voters." To be fair, the Dividst was and is describing an aspirational goal, while Mr. Cost is positing a historical political hypothesis. The important question for both of us is whether a small sliver of the electorate who are truly independent (i.e. not self-described "Independents" who actually vote one party as reliably as partisans) are, or could be, a swing vote that determines elections when using divided government as an organizing principle. Does this "decisive quantum of voters" exist? How big is it? Can we quantify the dividist "quantum" vote? And what does it mean for the 2018 midterms? 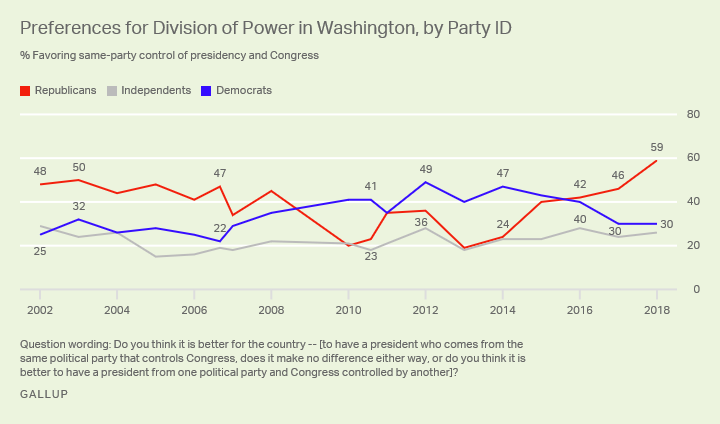 "The trend makes it clear that members of the president's party are almost always more likely than the opposing party to say it's better to have the same party controlling the White House and Congress... As indicated above, members of the party in opposition to the president tend to be more likely to say it's better if the president and the congressional majority are from different parties. This suggests they tend to focus more on ameliorating the current political situation than on envisioning what might be their ideal." The problem is that the question poses a non-existent, non-partisan, apolitical unified government alternative to divided government. It's kind of like asking "Do you prefer divided government or The Council of Elrond?" The fantasy apolitical alternative to divided government is never found on a real-world ballot. The question poses a choice that does not exist for voters. Buried in Gallup's summary chart is a small independent dividist minority vote that swings elections, sometimes voting with Democrats, sometimes with Republicans, in order to maintain a divided federal government state. A "decisive quantum of voters" is there but we have to unpack it. The self identified "Independents" row includes Republican and Democratic Party leaners. Political science tells us they vote the same as their partisan counterparts, so we have to make some reasonable "back of the envelope" assumptions to quantify the "quantum". We'll assume self-identified Rs, Ds, I's are roughly evenly split 1/3, 1/3, 1/3. We'll also assume that most of the "Independent" GOP Leaners are in the Same Party column and there is a healthy dose of "Independent" Democratic Leaners in the Different Parties column. Peeling off half that number leaves ~18% True Independents that prefer Different Parties / Divided Government. And if Indies represent 1/3 of the electorate, the Dividist's SWAG conclusion is that the Gallup Poll shows a "decisive quantum of voters" to be about 6% of the electorate. Your mileage may vary. "We find that between 6 and 18 percent of voters, depending on the method of measurement, prefer divided government. One to three percent prefer unified government. The overwhelming number of voters, however, are partisans who should not be expected to support divided government, yet are classified as such by prior measures. These percentages hold across the 2004 and 2008 presidential elections and across state (Virginia & New Jersey) and national elections. Therefore, it is not surprising that studies using prior measures find statistically insignificant effects of preferences for divided government on voting. The newer survey instruments presented here show that far fewer voters prefer divided government than originally believed, but that this smaller group of voters act on their preferences by voting in ways that reflects a desire for divided government and, at the margins, can create divided government in close elections." " For those on the trail of the elusive swing voter, it may be most notable that the libertarian vote shifted sharply in 2004. Libertarians preferred George W. Bush over Al Gore by 72 to 20 percent, but Bush’s margin dropped in 2004 to 59-38 over John Kerry. Congressional voting showed a similar swing from 2002 to 2004. Libertarians apparently became disillusioned with Republican overspending, social intolerance, civil liberties infringements, and the floundering war in Iraq. If that trend continues into 2006 and 2008, Republicans will lose elections they would otherwise win. The libertarian vote is in play. At some 13 percent of the electorate, it is sizable enough to swing elections. Pollsters, political strategists, candidates, and the media should take note of it." The Cato terminology in this analysis requires some qualification. Their definition of a Libertarian voter includes anyone who self describes as "social liberal and fiscal conservative". That's a reach. Many of these voters would recoil at dogmatic Libertarian policy positions. At best we might characterize these voters as "libertarianish" but open to moderate/centrist compromises with both right and left statist policies. "Swing Voter" is the more important term in this analysis, because that's what they do. "A Washington Post poll in August found that about a third of all voters call themselves independents. But “nearly two-thirds of Americans who describe themselves as independents act very much like partisan Republicans or partisan Democrats.” Another quarter have a low interest in politics and are unlikely to vote. 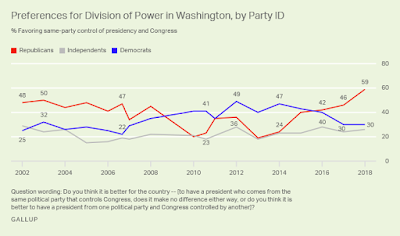 Which leaves 13 percent of the independents, or about five percent of the total electorate, designated by the Post as “Deliberators,” people genuinely open to candidates of both parties. More than half of them say they’ve voted for candidates of both parties in the past... Both parties are working hard to turn out their base votes. They should devote equal effort to appealing to the independent libertarian-leaning voters who are still undecided." These studies, polls and analysis are consistent with the Dividist belief and the Jay Cost hypothesis. There is a True Independent vote that represents 12-15% of the electorate. Independents being independent, much of this vote will cancel itself out. But, about half of this True Indie block, representing 5-6% of the electorate, is a "decisive quantum of voters in the middle" that self-organizes around the ideas of checks, balance, separation of power, and vote as a block for divided government. Cato calls them a "libertarian swing vote." We call them dividists. It is a small block, but it is real. In an election cycle where one party is highly enthused and the other is not, a strong motivated base of either party can swamp the dividist vote. 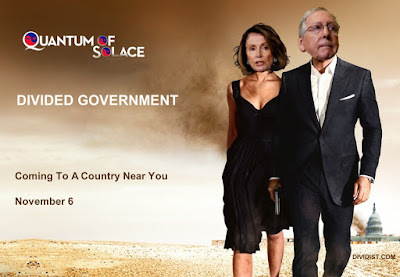 In an election cycle where both parties are highly motivated with an equally strong GOTV and enthusiastic base - like 2018 - the dividist quantum is decisive. I've been saying this for a while. In a normal midterm, "all politics is local", Indies cancel themselves out, & partisan #GOTV is determinative. Republicans retain the Senate majority picking up a net 1 or 2 seats. Democrats win the House majority with a net gain of ~35 seats. 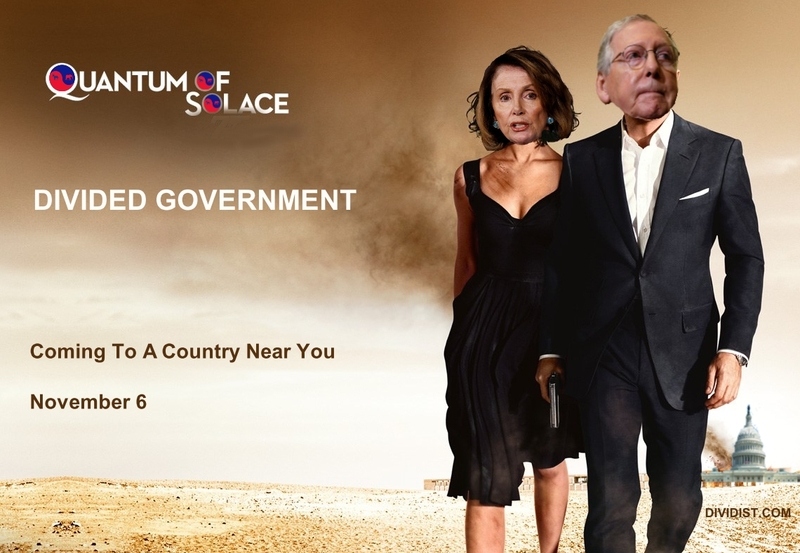 Divided Government is emphatically restored.